Need quick & simple dinner ideas? Add this simple tortilla soup recipe to the menu! It’s delicious, & like most Mason jar soup recipes, super easy. Needless to say, I always try to find ways to use leftovers. Whether it’s packing for the hubby to take to the office or using them in tomorrow night’s dinner, I’ve gotten pretty creative at putting leftovers to work. This simple tortilla soup recipe is a great (and easy) way to use up any leftover chicken lingering in your fridge. In addition to being a great way to use up leftovers, this recipe is for a healthy chicken tortilla soup. Yay! However, that can be our little secret because it’s so good your family won’t guess it’s actually good for them. 😉 In fact, I would go so far as to say it is the best tortilla soup recipe I have tried. Not only is this simple tortilla soup recipe delicious, it’s quick and easy to make which is a real boon on those busy weeknights when I haven’t even thought of dinner until someone says “I’m hungry.” (Unfortunately, this happens more than I would care to admit recently.) 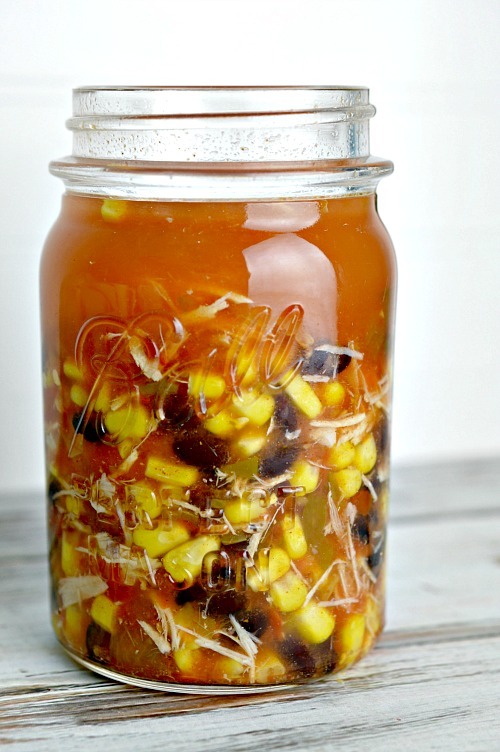 You can whip up this Mason jar soup recipe in as little as 15 minutes. 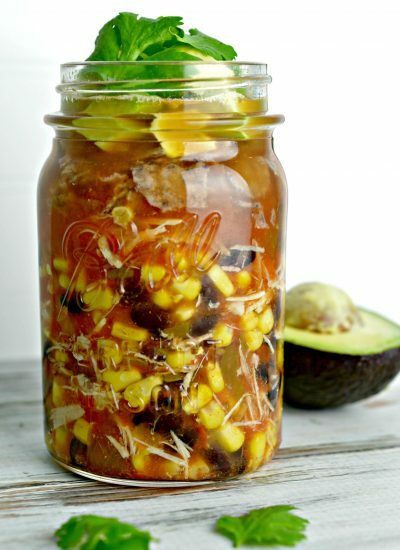 Obviously, you don’t have to serve this simple tortilla soup recipe in a Mason jar, but I personally think sticking to it as a Mason jar soup recipe makes it a little more fun. Heck, I’ll try just about anything to get the kiddo to put something nutritious in his mouth! Furthermore, serving this healthy chicken tortilla soup in Mason jars makes it a little more portable. 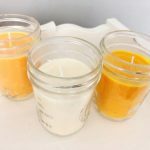 For example, if your moving from the kitchen to the great outdoors to enjoy your dinner, Mason jars tend to reduce the risk of sloshing soup all over. Are you sold on this simple tortilla soup recipe? I thought you would be! So, let’s get cooking! 1. 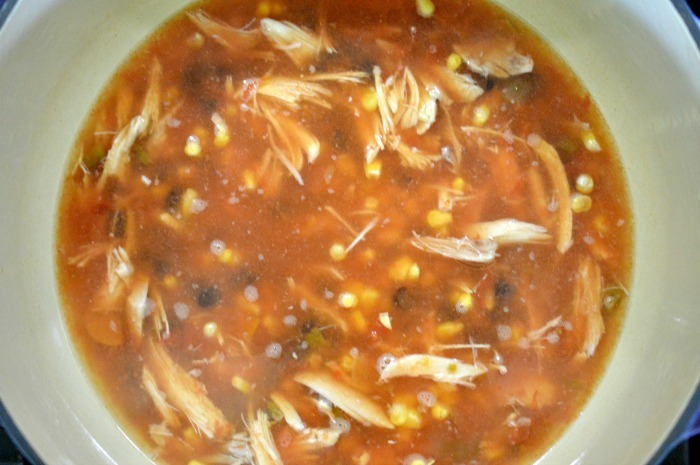 In a large stock pot, mix together broth, water, salsa, chicken, corn, and black beans. 2. Heat the mixture until cooked through (about 8 minutes). 3. While the mixture is heating, crush the tortilla chips into small pieces. Tip: To keep things tidy, place the chips in a sealed Ziplock bag and crush with a rolling pin or the bottom of a glass. 4. 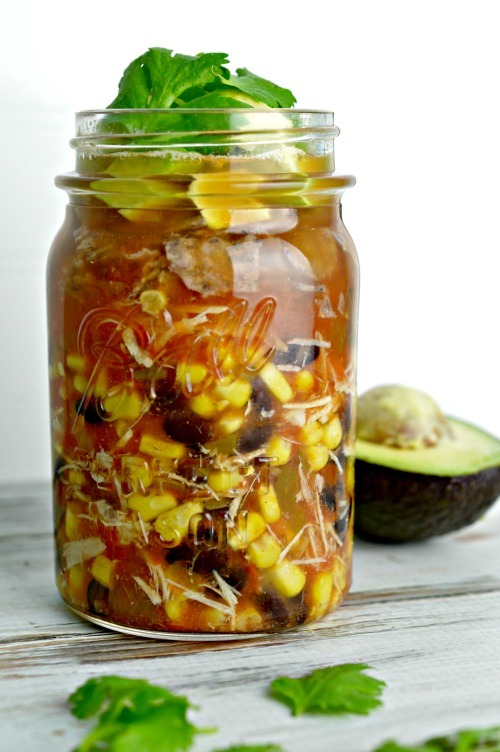 Ladle this healthy chicken tortilla soup into Mason jars. If serving immediately, proceed to step 5. 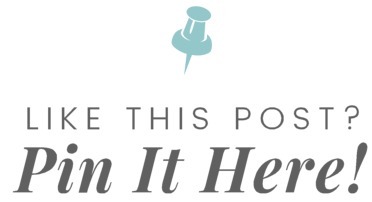 Otherwise, seal the Mason jars and store them in the fridge. 5. Top with crushed chips, diced avocado, and fresh cilantro (or whatever toppings you have chosen). 6. 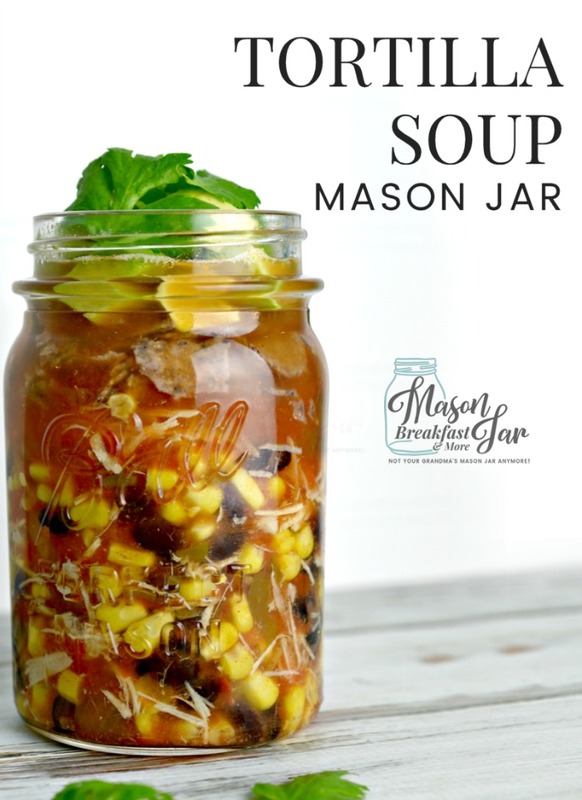 Enjoy your Mason jar soup recipe! Slow cooker taco soup – Make it with ground beef or chicken. Friendship bean soup – Makes for a delicious dinner and a heartfelt gift! Hearty ham and potato soup – A super easy crockpot creation.